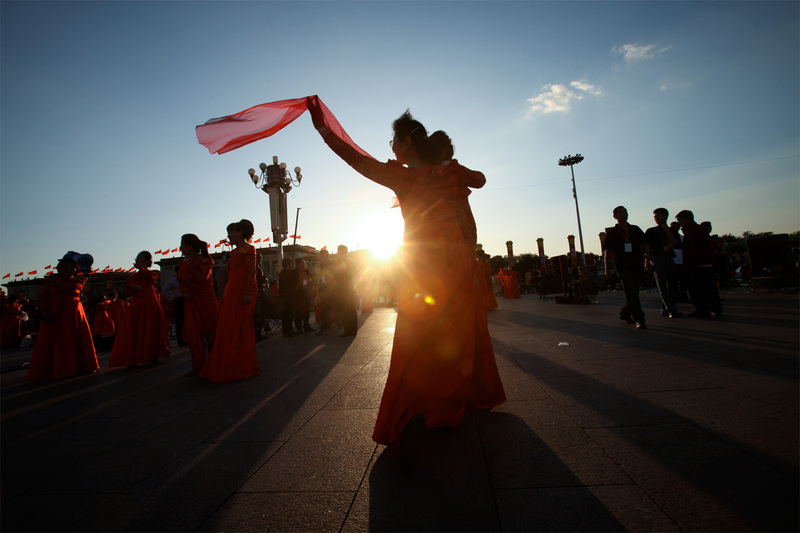 A group of female performers rehearse a routine one last time at sunset on National Day, October 1, 2009 in Tiananmen Square. National Day marks the founding of the People’s Republic of China. 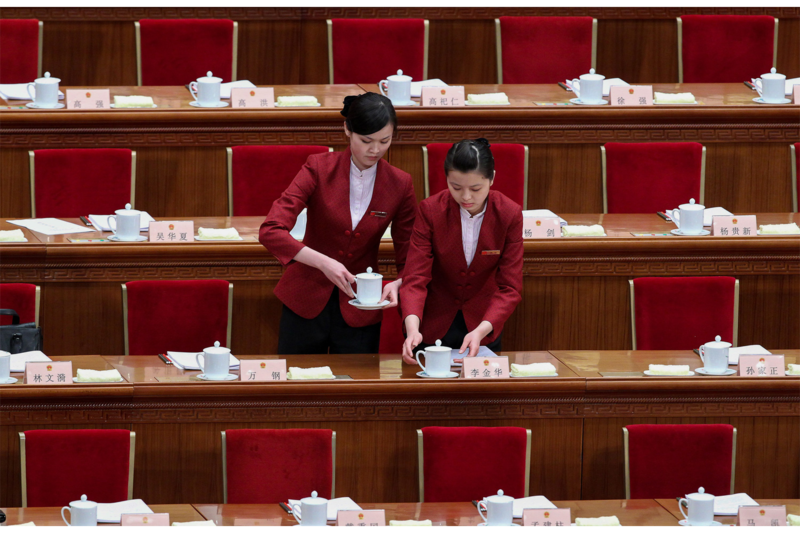 Two waitresses arrange tea cups at each parliament member’s seat in the Great Hall of the People, March 5, 2010, for the Third Session of the 11th National People’s Congress. Deputies take a group photo on the rostrum inside the Great Hall of the People before the First Session of the 12th NPC begins, March 13, 2013. 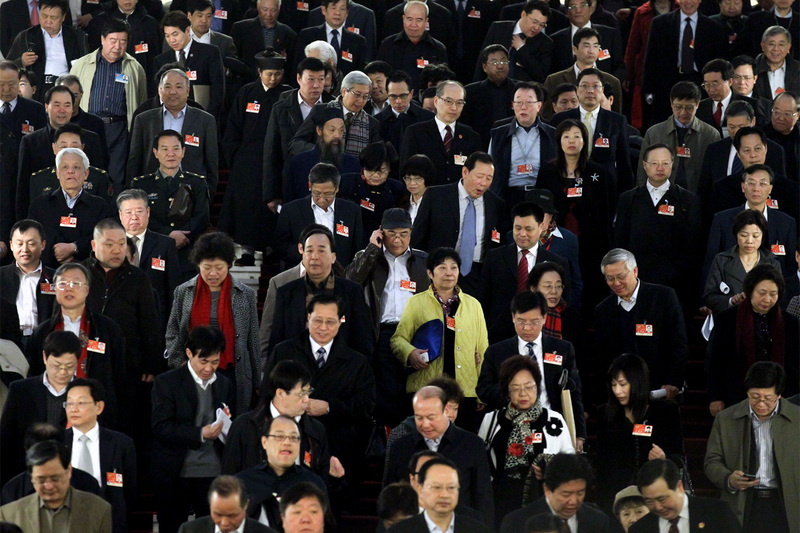 President Xi Jinping is seated in the first row, center. A female deputy sits among her fellow deputies as they listen to a report on the work of the government inside the Great Hall, March 5, 2013. 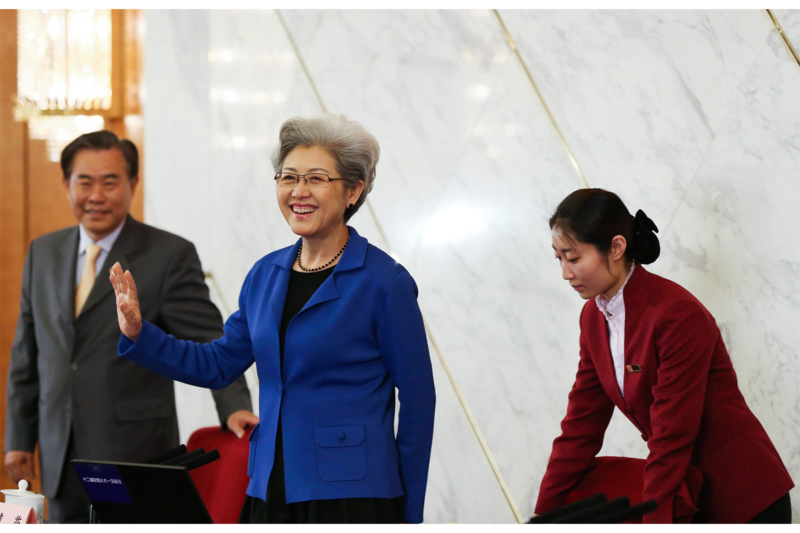 Vice Foreign Minister Fu Ying attends a press conference during the “two sessions,” March 4, 2013. Fu is the first female spokesperson for the National People’s Congress. Before assuming her role as Vice Foreign Minister, she served as the Chinese ambassador to the United Kingdom. Deputies file out during a break in meetings inside the Great Hall, March 11, 2011. Female staff attend to Chongqing Mayor Huang Qifan during a press conference, March 4, 2011, at the Capital Hotel. Huang was close to the later disgraced Bo Xilai, who was Party Secretary of Chongqing at the time. A waitress prepares to open the door for others to pass through at the Capital Hotel, March 4, 2011. 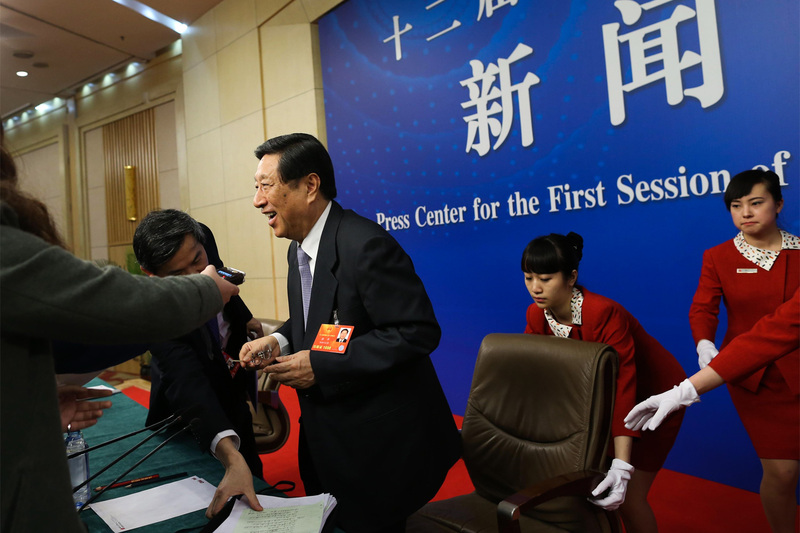 Li Zhaoxing, a spokesperson for the NPC, turns to answer questions from journalists after a press conference, March 4, 2011. 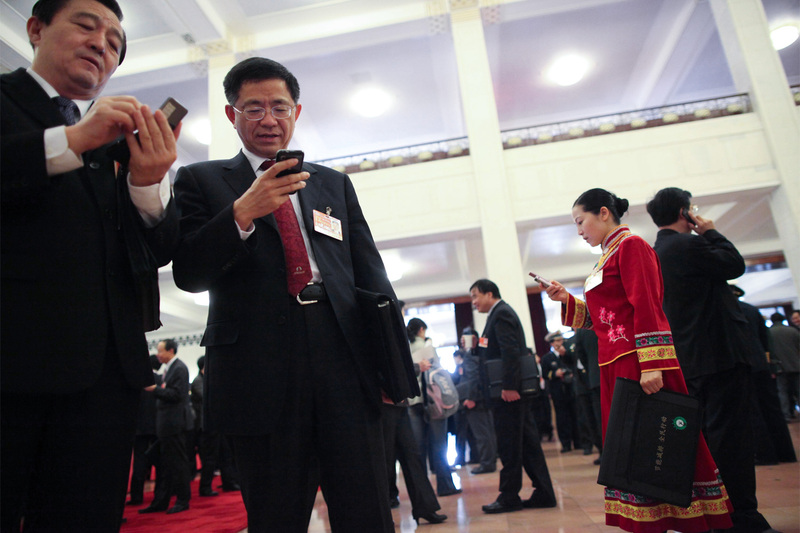 NPC members check their mobile phones, March 8, 2011, at the Great Hall of the People. 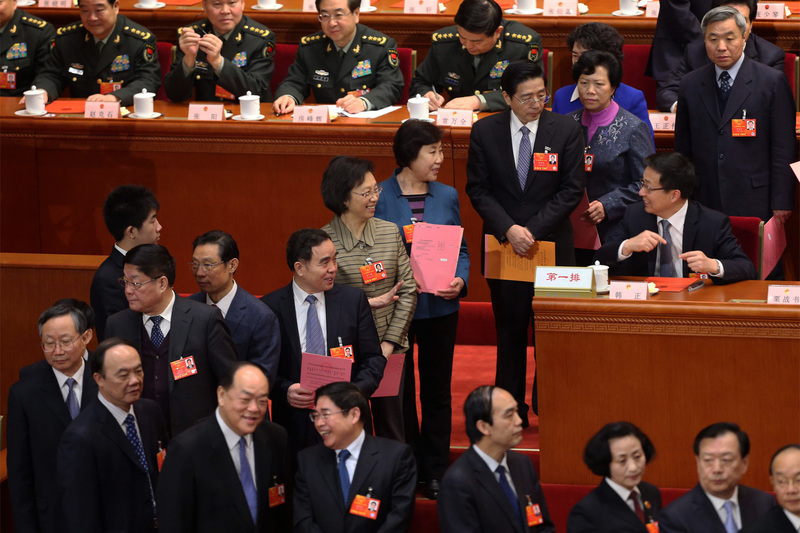 During a break between meetings, a female staffer talks with a member of the CPPCC, second from left, and two male staffers, March 5, 2011, on the second floor of the Great Hall of the People. Security guards for Zhang Chunxian, Secretary of the Xinjiang Provincial Committee of the CPC, stand outside the men’s restroom during the Xinjiang Provincial Delegation Open Day, March 8, 2011. 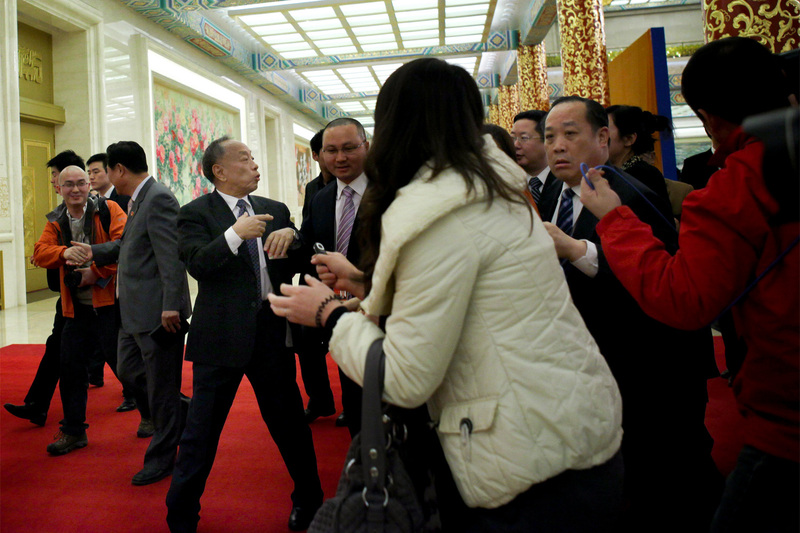 Zhang, not pictured, had stepped inside the restroom and journalists had attempted to follow him in to ask questions. 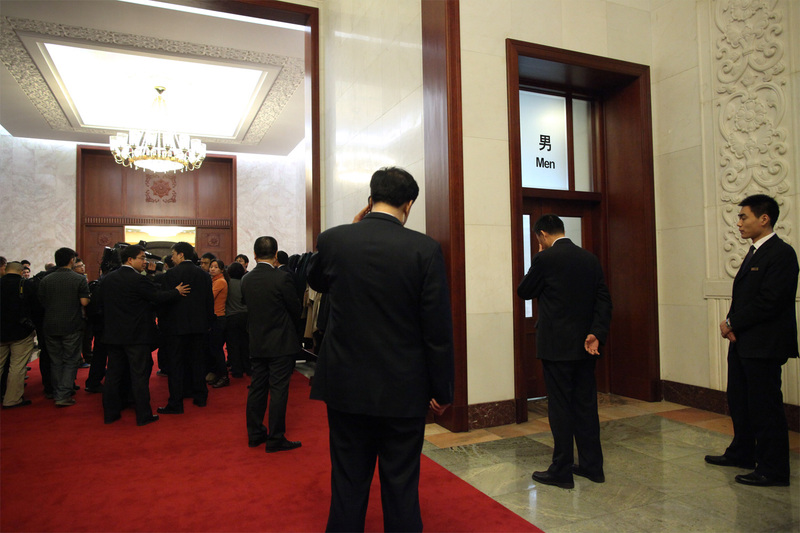 Deputies of the NPC queue up to vote whether to approve the nomination of Li Keqiang as the next Premier of China’s State Council during the Fifth Plenary Session of the First Session of the 12th NPC at the Great Hall of the People, March 15, 2013. The vote was open to the media. Li’s nomination was approved, making him the second most powerful official in China, directly behind Xi Jinping. 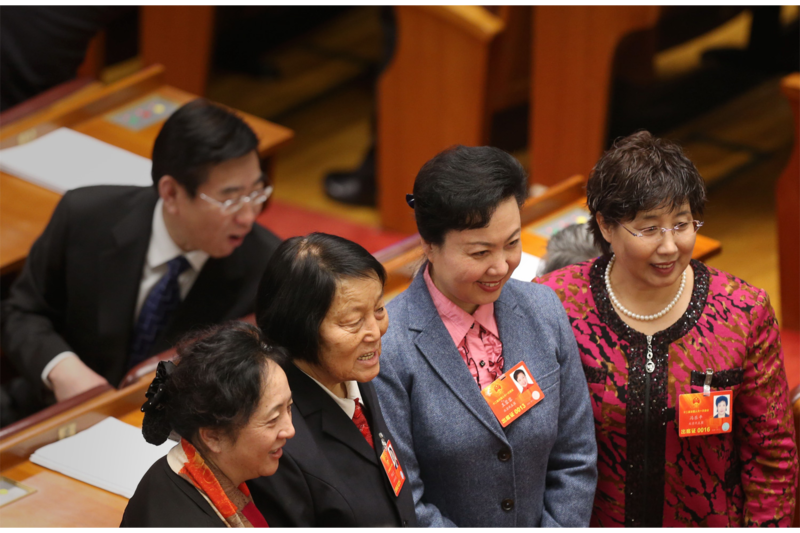 A deputy in ethnic clothing, bottom left, stands for a photo with other female deputies before the start of meetings, March 5, 2013, in the Great Hall of the People. 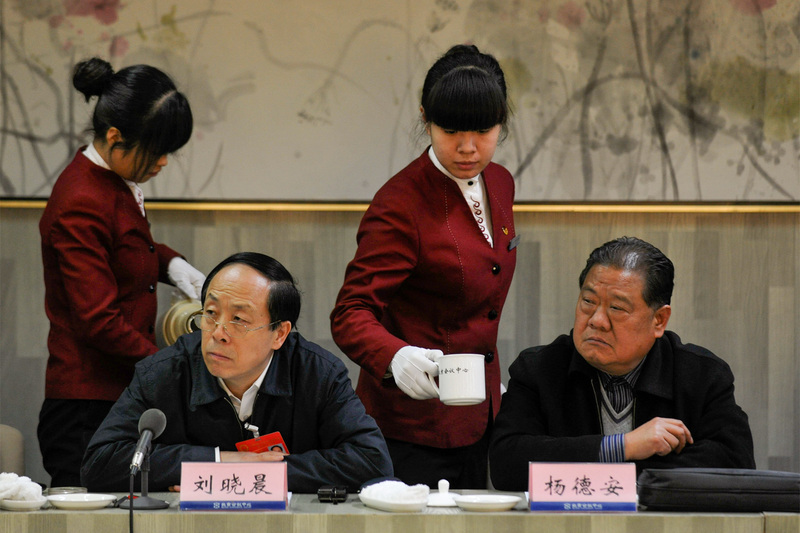 NPC deputies Liu Xiaochen (seated left) and Yang De’an listen to a speech by a Beijing deputy during a forum between NPC and Beijing Municipal People’s Congress deputies, as two female waitresses pass to refill tea, January 20, 2011. 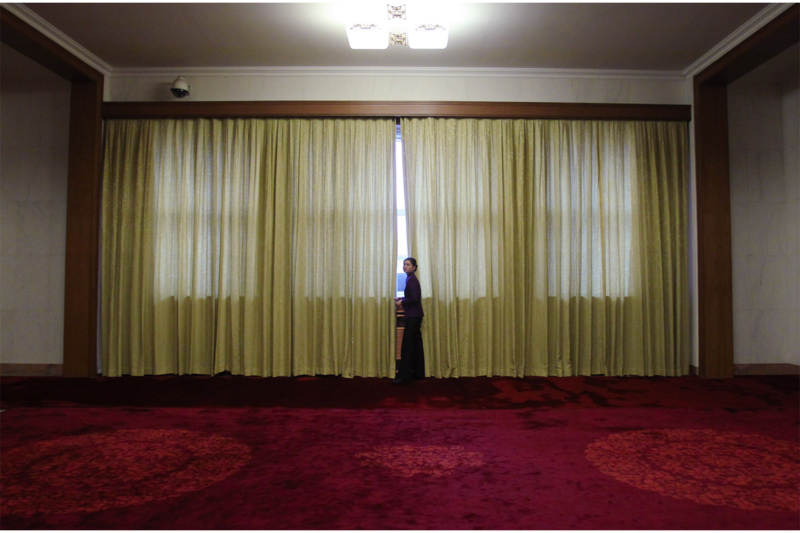 A waitress stands by a window in the corridor outside the Great Hall of the People, March 10, 2011, during the afternoon of the Fourth Session of the 11th CPPCC. 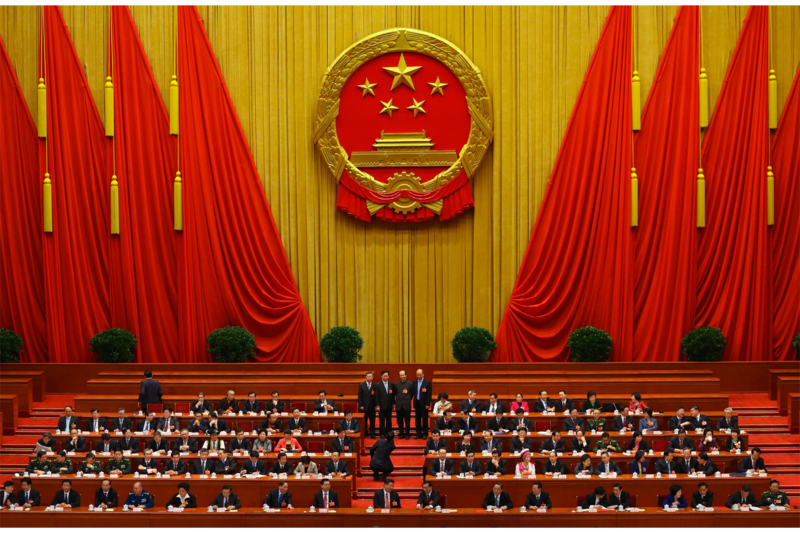 Each March, some 5,000 delegates from across China gather in Beijing for the annual meetings of the National People’s Congress (NPC), China’s legislature, and the Chinese People’s Political Consultative Conference (CPPCC), an advisory body. 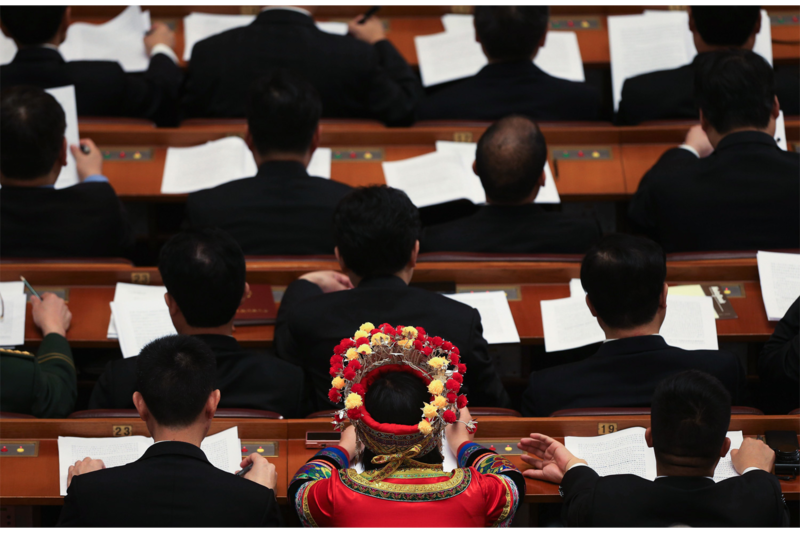 In practice, the “two sessions,” as the meetings are known, are largely ceremonial—neither body plays a leading role in shaping policy—but they are closely watched for signals from China’s more senior leaders about the shape of politics in the year to come (usually revealed in lengthy speeches) and they are a key moment for the unveiling—and rubber stamping—of new laws. While working on assignment for The Beijing News, Meng Han covered the two conclaves year after year. She found her camera drawn to the supporting roles played by the women at the meetings: dancing in the opening ceremonies, pouring tea, entertaining guests, and shepherding delegates through the cavernous corridors of the Great Hall of the People. Their work may appear relatively unimportant, but the many government bodies charged with their selection and training devote considerable energy to making sure their physical and political dimensions measure up. In a video published by The Beijing News last year, one “Great Hall of the People Beauty” explains that women must be at least 1.65 meters tall and that they must undergo extensive training, including military drills, before serving at the meetings. At their dormitories outside of Beijing, they must adhere to strict norms of modesty eschewing inappropriate attire and not “wearing pajamas in the hallways even in an all-female dorm.” They must also agree not to leave their dormitories or have contact with “outsiders.” The Great Hall does not recruit these servicewomen from Beijing out of concern, the report says, that they might be tempted to return home during their four-year term. In their training, great emphasis is placed on uniformity. They must walk in perfectly straight rows and guard against so much as the edge of a teacup’s failing to fall in line.